For other uses, see El Clásico (disambiguation). El Clásico (Spanish pronunciation: [el ˈklasiko]; Catalan: El Clàssic, pronounced [əl ˈklasik]; "The Classic") is the name given in football to any match between fierce rivals Real Madrid and FC Barcelona. Originally it referred only to those competitions held in the Spanish championship, but nowadays the term has been generalized, and tends to include every single match between the two clubs: UEFA Champions League, Copa del Rey, etc. Other than the UEFA Champions League Final, it is considered one of the biggest club football games in the world, and is among the most viewed annual sporting events. A fixture known for its intensity, it has featured memorable goal celebrations from both teams, often involving mocking the opposition. The rivalry comes about as Madrid and Barcelona are the two largest cities in Spain, and they are sometimes identified with opposing political positions, with Real Madrid viewed as representing Spanish nationalism and Barcelona viewed as representing Catalan nationalism. The rivalry is regarded as one of the biggest in world sport. The two clubs are among the richest and most successful football clubs in the world; in 2014 Forbes ranked Barcelona and Real Madrid the world's two most valuable sports teams. Both clubs have a global fanbase; they are the world's two most followed sports teams on social media. Barcelona leads the head-to-head results in competitive matches with 96 wins to Real Madrid's 95; Barcelona also leads in total matches with 115 wins to Real Madrid's 99 as of match played on 2 March 2019. Along with Athletic Bilbao, they are the only clubs in La Liga to have never been relegated. The conflict between Real Madrid and Barcelona has long surpassed the sporting dimension, so that elections to the clubs' presidencies are strongly politicized. Phil Ball, the author of Morbo: The Story of Spanish Football, says about the match; "they hate each other with an intensity that can truly shock the outsider". As early as the 1930s, Barcelona "had developed a reputation as a symbol of Catalan identity, opposed to the centralising tendencies of Madrid". In 1936, when Francisco Franco started the Coup d'état against the democratic Second Spanish Republic, the president of Barcelona, Josep Sunyol, member of the Republican Left of Catalonia and Deputy to The Cortes, was arrested and executed without trial by Franco's troops (Sunyol was exercising his political activities, visiting Republican troops north of Madrid). Barcelona was on top of the list of organizations to be purged by the National faction, just after communists, anarchists, and independentists. During the Franco dictatorship, most citizens of Barcelona were in strong opposition to the fascist-like régime. During the dictatorships of Miguel Primo de Rivera and of Francisco Franco, all regional languages and identities in Spain were frowned upon and restrained. In this period, Barcelona gained their motto Més que un club (English: More than a club) because of its alleged connection to Catalan nationalist as well as to progressive beliefs. During Franco's regime, however, Barcelona was granted profit due to its good relationship with the dictator at management level, even giving two awards to him. The links between senior Real Madrid representatives and the Francoist regime were undeniable; for most of the Catalans, Real Madrid was regarded as "the establishment club", despite the fact that presidents of both clubs like Josep Sunyol and Rafael Sánchez Guerra, suffered at the hands of Franco's supporters in the Spanish Civil War. The image for both clubs was further affected by the creation of Ultras groups, some of which became hooligans. In 1980, Ultras Sur was founded as a far-right-leaning Real Madrid ultras group, followed in 1981 by the foundation of the initially left-leaning and later on far-right, Barcelona ultras group Boixos Nois. Both groups became known for their violent acts, and one of the most conflictive factions of Barcelona supporters, the Casuals, became a full-fledged criminal organisation. For many people, Barcelona is still considered as "the rebellious club", or the alternative pole to "Real Madrid's conservatism". According to polls released by CIS (Centro de Investigaciones Sociológicas), Real Madrid is the favorite team of most of the Spanish residents, while Barcelona stands in the second position. In Catalonia, forces of all the political spectrum are overwhelmingly in favour of Barcelona. Nevertheless, the support of the blaugrana club goes far beyond from that region, earning its best results among young people, sustainers of a federal structure of Spain and citizens with left-wing ideology, in contrast with Real Madrid fans which politically tend to adopt right-wing views. On 13 June 1943, Real Madrid beat Barcelona 11–1 at home in the second leg of a semi-final of the Copa del Generalísimo, the Copa del Rey having been renamed in honour of General Franco. 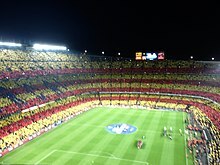 The first leg, played at Barcelona's Les Corts stadium in Catalonia, had ended with Barcelona winning 3–0. Madrid complained about all the three goals that referee Fombona Fernández had allowed for Barcelona, with the home supporters also whistling Madrid throughout, whom they accused of employing roughhouse tactics, and Fombona for allowing them to. A campaign began in Madrid. Barcelona player Josep Valle recalled: "The press officer at the DND and ABC newspaper wrote all sorts of scurrilous lies, really terrible things, winding up the Madrid fans like never before". Former Real Madrid goalkeeper Eduardo Teus, who admitted that Madrid had "above all played hard", wrote in a newspaper: "the ground itself made Madrid concede two of the three goals, goals that were totally unfair". Barcelona fans were banned from traveling to Madrid. Real Madrid released a statement after the match which former club president (1985–1995) Ramón Mendoza explained, "The message got through that those fans who wanted to could go to El Club bar on Calle de la Victoria where Madrid's social center was. There, they were given a whistle. Others had whistles handed to them with their tickets." The day of the second leg, the Barcelona team were insulted and stones were thrown at their bus as soon as they left their hotel. Barcelona's striker Mariano Gonzalvo said of the incident, "Five minutes before the game had started, our penalty area was already full of coins." Barcelona goalkeeper Lluis Miró rarely approached his line—when he did, he was armed with stones. As Francisco Calvet told the story, "They were shouting: Reds! Separatists!... a bottle just missed Sospedra that would have killed him if it had hit him. It was all set up." Real Madrid went 2–0 up within half an hour. The third goal brought with it a sending off for Barcelona's Benito García after he made what Calvet claimed was a "completely normal tackle". Madrid's José Llopis Corona recalled, "At which point, they got a bit demoralized," while Mur countered, "at which point, we thought: 'go on then, score as many as you want'." Madrid scored in minutes 31', 33', 35', 39', 43' and 44', as well as two goals ruled out for offside, made it 8–0. Basilo de la Morena had been caught out by the speed of the goals. In that atmosphere and with a referee who wanted to avoid any complications, it was humanly impossible to play... If the azulgranas had played badly, really badly, the scoreboard would still not have reached that astronomical figure. The point is that they did not play at all." Both clubs were fined 2,500 pesetas by the Royal Spanish Football Federation and, although Barcelona appealed, it made no difference. Piñeyro resigned in protest, complaining of "a campaign that the press has run against Barcelona for a week and which culminated in the shameful day at Chamartín". The match report in the newspaper La Prensa described Barcelona's only goal as a "reminder that there was a team there who knew how to play football and that if they did not do so that afternoon, it was not exactly their fault". Another newspaper called the scoreline "as absurd as it was abnormal". According to football writer Sid Lowe, "There have been relatively few mentions of the game [since] and it is not a result that has been particularly celebrated in Madrid. Indeed, the 11–1 occupies a far more prominent place in Barcelona's history. This was the game that first formed the identification of Madrid as the team of the dictatorship and Barcelona as its victims." Fernando Argila, Barcelona's reserve goalkeeper from the game, said, "There was no rivalry. Not, at least, until that game." Alfredo Di Stéfano's controversial 1953 transfer to Real Madrid instead of Barcelona intensified the rivalry. The rivalry was intensified during the 1950s when the clubs disputed the signing of Alfredo Di Stéfano. Di Stéfano had impressed both Barcelona and Real Madrid while playing for Los Millionarios in Bogotá, Colombia, during a players' strike in his native Argentina. Both Real Madrid and Barcelona attempted to sign him and, due to confusion that emerged from Di Stéfano moving to Millonarios from River Plate following the strike, both clubs claimed to own his registration. After intervention from FIFA representative Muñoz Calero, it was decided that both Barcelona and Real Madrid had to share the player in alternate seasons. Barcelona's humiliated president was forced to resign by the Barcelona board, with the interim board cancelling Di Stéfano's contract. This ended the long struggle for Di Stéfano, as he moved definitively to Real Madrid. 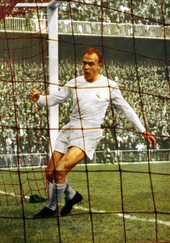 Di Stéfano became integral in the subsequent success achieved by Real Madrid, scoring twice in his first game against Barcelona. With him, Madrid won the initial five European Champions Cup competitions. The 1960s saw the rivalry reach the European stage when they met twice at the European Cup, Real Madrid winning in 1960 and Barcelona winning in 1961. In 2000, Real Madrid's then-presidential candidate, Florentino Pérez, offered Barcelona's vice-captain Luís Figo $2.4 million to sign an agreement binding him to Madrid if he won the elections. If the player broke the deal, he would have to pay Pérez $30 million in compensation. When his agent confirmed the deal, Figo denied everything, insisting, "I'll stay at Barcelona whether Pérez wins or loses." He accused the presidential candidate of "lying" and "fantasizing". He told Barcelona teammates Luis Enrique and Pep Guardiola he was not leaving and they conveyed the message to the Barcelona squad. On 9 July, Sport ran an interview in which he said, "I want to send a message of calm to Barcelona's fans, for whom I always have and always will feel great affection. I want to assure them that Luís Figo will, with absolute certainty, be at the Camp Nou on the 24th to start the new season... I’ve not signed a pre-contract with a presidential candidate at Real Madrid. No. I'm not so mad as to do a thing like that." The only way Barcelona could prevent Figo's transfer to Real Madrid was to pay the penalty clause, $30 million. That would have effectively meant paying the fifth highest transfer fee in history to sign their own player. Barcelona's new president, Joan Gaspart, called the media and told them, "Today, Figo gave me the impression that he wanted to do two things: get richer and stay at Barça." Only one of them happened. The following day, 24 July, Figo was presented in Madrid and handed his new shirt by Alfredo Di Stéfano. His buyout clause was set at $180 million. Gaspart later admitted, "Figo's move destroyed us." On his return to Barcelona in a Real Madrid shirt, banners with "Judas", "Scum" and "Mercenary" were hung around the stadium. Thousands of fake 10,000 peseta notes had been printed and emblazoned with his image, were among the missiles of oranges, bottles, cigarette lighters, even a couple of mobile phones were thrown at him. In his third season with Real Madrid, the 2002 Clásico at Camp Nou produced one of the defining images of the rivalry. Figo was mercilessly taunted throughout; missiles of coins, a knife, a whisky bottle, were raining down from the stands, mostly from areas populated by the Boixos Nois where he had been taking a corner. Among the debris was a pig's head. During the last three decades, the rivalry has been augmented by the modern Spanish tradition of the Pasillo, where one team is given the guard of honor by the other team, once the former clinches the La Liga trophy before El Clásico takes place. This has happened in three occasions. First, during El Clásico that took place on 30 April 1988, where Real Madrid won the championship on the previous round. Then, three years later, when Barcelona won the championship two rounds before El Clásico on 8 June 1991. The last pasillo, and most recent, took place on 7 May 2008, and this time Real Madrid had won the championship. In May 2018, Real Madrid refused to perform Pasillo to Barcelona even though the latter had already wrapped up the championship a round prior to their meeting. The two teams met again in the UEFA Champions League semi-final in 2002, with Real Madrid winning 2–0 in Barcelona and a 1–1 draw in Madrid, resulting in a 3–1 aggregate win for Madrid. The match was dubbed by Spanish media as the "Match of the Century". While El Clásico is regarded as one of the fiercest rivalries in world football, there have been rare moments when fans have shown praise for a player on the opposing team. In 1980, Laurie Cunningham was the first Real Madrid player to receive applause from Barcelona fans at Camp Nou; after excelling during the match, and with Madrid winning 2–0, Cunningham left the field to a standing ovation from the locals. On 26 June 1983, during the second leg of the Copa de la Liga final at the Santiago Bernabéu in Madrid, having dribbled past the Real Madrid goalkeeper, Barcelona star Diego Maradona ran towards an empty goal before stopping just as the Madrid defender came sliding in an attempt to block the shot and crashed into the post, before Maradona slotted the ball into the net. The manner of Maradona's goal led to many Madrid fans inside the stadium start applauding. 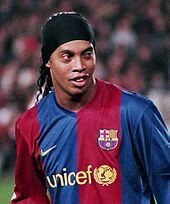 In November 2005, Ronaldinho became the second Barcelona player to receive a standing ovation from Madrid fans at the Santiago Bernabéu. After dribbling through the Madrid defence twice to score two goals in a 3–0 win, Madrid fans paid homage to his performance with applause. On 21 November 2015, Andrés Iniesta became the third Barcelona player to receive applause from Real Madrid fans while he was substituted during a 4–0 away win, with Iniesta scoring Barça's third – it should be noted however that Iniesta was already a popular figure throughout Spain for scoring the nation’s World Cup winning goal in 2010. A 2007 survey by the Centro de Investigaciones Sociológicas showed that 32% of the Spanish population supported Real Madrid, while 25% supported Barcelona. In third place came Valencia, with 5%. According to an Ikerfel poll in 2011, Barcelona is the most popular team in Spain with 44% of preferences, while Real Madrid is second with 37%. Atlético Madrid, Valencia and Athletic Bilbao complete the top five. Both clubs have a global fanbase: they are the world's two most followed sports teams on social media—on Facebook, as of July 2018, Real Madrid has 107 million fans, Barcelona has 103 million fans, on Instagram, Real Madrid has 60 million followers, Barcelona has 57 million followers. The rivalry intensified in 2011 where, due to the final of the Copa Del Rey and the meeting of the two in the UEFA Champions League, Barcelona and Real Madrid were scheduled to meet each other four times in 18 days. Several accusations of unsportsmanlike behaviour from both teams and a war of words erupted throughout the fixtures which included four red cards. Spain national team coach Vicente del Bosque stated that he was "concerned" that due to the rising hatred between the two clubs, that this could cause friction in the Spain team. In recent years, the rivalry has been "encapsulated" by the rivalry between Cristiano Ronaldo and Lionel Messi. Following the star signings of Neymar and Luis Suárez to Barcelona, and Gareth Bale and Karim Benzema to Madrid, the rivalry was expanded to a battle of the clubs' attacking trios, BBC (Bale, Benzema, Cristiano) against MSN (Messi, Suárez, Neymar). Ronaldo left Real Madrid for Juventus in 2018, and in the week prior to the first meeting of the teams in the 2018–19 La Liga, Messi sustained an arm injury ruling him out of the match. It would be the first time since 2007 that the Clásico had featured neither player, with some in the media describing it as the 'end of an era’. Iniesta's long spell at Barcelona had also ended after playing in 38 clashes from November 2004 to May 2018. Barcelona won the match 5–1. A fixture known for its intensity and indiscipline, it has also featured memorable goal celebrations from both teams, often involving mocking the opposition. In October 1999, Real Madrid forward Raúl silenced 100,000 Barcelona fans at the Camp Nou when he scored before he celebrated by putting a finger to his lips as if telling the crowd to be quiet. In 2009 Barcelona captain Carles Puyol kissed his Catalan armband in front of Madrid fans at the Bernabéu. Cristiano Ronaldo twice gestured to the hostile crowd to “calm down” after scoring against Barcelona at the Nou Camp in 2012 and 2016. In April 2017, Messi celebrated his 93rd minute winner for Barcelona against Real Madrid at the Bernabéu by taking off his Barcelona shirt and holding it up to incensed Real Madrid fans – with his name and number facing them. On 2 March 2019, Barcelona overtook Real Madrid in El Clásico victories in competitive matches after winning an away game 1–0. ^ Although not recognized by the current Royal Spanish Football Federation as an official match, it is still considered a competitive match between Barcelona and Real Madrid by statistics sources and the media. Players in bold are still active for Real or Barcelona. Lionel Messi is the all-time top scorer in El Clásico history with 26 goals. Five players have been able to score more than one hat trick: Jaime Lazcano, Santiago Bernabéu, Paulino Alcántara, Lionel Messi and Ferenc Puskás have all scored two hat-tricks in El Clásico history (2). Lionel Messi has delivered the most assists in El Clásico history (14). Players in bold are still active for Real Madrid or Barcelona. Javier Saviola was the most recent player to transfer between the two rivals, in 2007. The rivalry reflected in El Clásico matches comes about as Real Madrid and Barcelona are the most successful football clubs in Spain. As seen below, Barcelona leads Real Madrid 95–92 in terms of official overall trophies. While the Inter-Cities Fairs Cup is recognised as the predecessor to the UEFA Cup, it was not organised by UEFA. Consequently, UEFA does not consider clubs' records in the Fairs Cup to be part of their European record. However, FIFA does view the competition as a major honour. Note: FIFA recognized the winner of the Intercontinental Cup as a World Champion. Note: The Inter-Cities Fairs Cup is not recognized in the UEFA records and statistics, but FIFA does view the competition as a major honour. ^ a b Does not include a goal scored in the 2017 International Champions Cup. ^ "El clàssic es jugarà dilluns". El Punt. 18 November 2010. Archived from the original on 31 December 2010. Retrieved 18 November 2010. ^ Benjamin Morris. "Is Messi vs. Ronaldo Bigger Than The Super Bowl?". FiveThirtyEight. ^ a b c d e f "Real Madrid-Barcelona: Celebrations in enemy territory". Marca. Retrieved 9 October 2018. ^ "Castilian Oppression v Catalan Nationalism – "El Gran Classico"". Footballblog.co.uk. 2 September 2009. Retrieved 20 October 2013. ^ "AFP: Barcelona vs Real Madrid rivalry comes to the fore". Google.com. 14 April 2011. Retrieved 20 October 2013. ^ Rookwood, Dan (28 August 2002). "The bitterest rivalry in world football". The Guardian. London. ^ Ball, Phil (21 April 2002). "Mucho morbo". The Guardian. London. Retrieved 1 May 2010. ^ a b c Burns, Jimmy, 'Don Patricio O’Connell: An Irishman and the Politics of Spanish Football' in "Irish Migration Studies in Latin America" 6:1 (March 2008), p. 44. Available online pg. 3,pg. 4. Retrieved 29 August 2010. ^ "Franco recibió dos medallas del Barça" (in Spanish). Diario AS. Retrieved 28 August 2010. ^ "El deporte en la guerra civil" (in Spanish). El Cultural. Retrieved 29 August 2010. ^ "Rafael Sánchez Guerra" (in Spanish). elpueblodeceuta.es. 30 June 2009. Archived from the original on 20 July 2011. Retrieved 29 August 2010. ^ "The Ultra Sur | El Centrocampista - Spanish Football and La Liga News in English". El Centrocampista. 27 October 2011. Retrieved 20 October 2013. ^ Dos Manzanas (14 June 2011). "Tres Boixos Nois detenidos por agredir a una mujer transexual en Barcelona". Dos manzanas. Retrieved 20 October 2013. ^ "La mafia de boixos nois se especializó en atracar a narcos - Sociedad - El Periódico". Elperiodico.com. Retrieved 20 October 2013. ^ "Great similarities between Barcelona and Celtic". vavel.com. 21 April 2012. Retrieved 5 December 2012. ^ "FourFourTwo's 50 Biggest Derbies in the World, No.2: Barcelona vs Real Madrid". fourfourtwo.com. 29 April 2016. Retrieved 30 May 2016. ^ "La izquierda es culé y la derecha, merengue, según el CIS" (in Spanish). LaVanguardia.com. 20 July 2009. Retrieved 4 September 2011. ^ "¿Del Madrid o del Barça?" (in Spanish). elpais.com. 23 February 2003. Retrieved 21 November 2015. ^ "Real Madrid v Barcelona: six of the best 'El Clásicos'". London: The Telegraph. 9 December 2011. Retrieved 19 December 2011. ^ a b c d "BBC SPORT | Football | Alfredo Di Stefano: Did General Franco halt Barcelona transfer?". BBC News. 7 July 2014. Retrieved 2 December 2014. ^ "Alfredo di Stéfano was one of football's greatest trailblazers". The Guardian. 7 July 2014. Retrieved 12 October 2018. ^ Deportes. "(Spanish)". 20minutos.es. Retrieved 20 October 2013. ^ "Real Madrid v. Barcelona: A Glance Back at Past Pasillos | Futfanatico: Breaking Soccer News". Futfanatico. 5 December 2011. Retrieved 20 October 2013. ^ "The pasillo controversy: Real Madrid should respect Barcelona with guard of honour". Goal.com. 4 May 2018. Retrieved 22 September 2018. ^ "Real win Champions League showdown". BBC News. 11 December 2008. Retrieved 7 August 2010. ^ "Rampant Ronaldinho receives standing ovation". BBC News. 11 December 2008. Retrieved 27 August 2010. ^ "Real Madrid 0 Barcelona 3: Bernabeu forced to pay homage as Ronaldinho soars above the galacticos". The Independent. Retrieved 29 November 2013. ^ "CIS Mayo 2007" (PDF) (in Spanish). Centro de Investigaciones Sociológicas. May 2007. Retrieved 2 September 2010. ^ "España se pasa del Madrid al Barcelona" (in Spanish). www.as.com. 10 October 2011. Retrieved 23 July 2012. ^ Sapa-DPA (29 April 2011). "Del Bosque concerned over Real-Barca conflict - SuperSport - Football". SuperSport. Archived from the original on 7 November 2012. Retrieved 20 October 2013. ^ Bate, Adam (25 October 2013). "Fear and Loathing". Sky Sports. Retrieved 12 January 2015. ^ "El club de los 100: MSN 91-88 BBC". Marca. 24 October 2015. ^ "Barcelona vs Real Madrid: First Clasico without Lionel Messi or Cristiano Ronaldo since 2007 marks end of era". Evening Standard. 26 October 2018. Retrieved 26 October 2018. ^ "No Messi or Ronaldo in El Clasico for first time since 2007". FourFourTwo. 20 October 2018. Retrieved 26 October 2018. ^ "Catalyst: The last El Clasico without Messi or Ronaldo was a defining moment in Barcelona's history". The Sun Dream Team. 23 October 2018. Retrieved 26 October 2018. ^ "Iniesta's eight greatest Clasico moments". Marca. 5 May 2018. Retrieved 26 October 2018. ^ "Barcelona 5–1 Real Madrid". BBC Sport. 28 October 2018. Retrieved 28 October 2018. ^ "Real Madrid vs. Barcelona – Football Match Report – March 2, 2019". ESPN.com. Retrieved 2019-03-03. ^ Bernabéu, Sid Lowe at the (2019-03-02). "Ivan Rakitic goal earns victory for dominant Barcelona over Real Madrid". The Observer. ISSN 0029-7712. Retrieved 2019-03-03. ^ "FC Barcelona vs Real Madrid CF since 1902". www.rsssf.com. Retrieved 4 March 2019. ^ "Real Madrid – Barcelona: Igualdad total en los 35 Clásicos en Copa" (in Spanish). Marca. 27 February 2019. Retrieved 4 March 2019. ^ "Barcelona: Messi finishes 2017 ahead of Cristiano Ronaldo with 54 goals - MARCA in English". MARCA in English. Retrieved 2017-12-24. ^ "Xavi, Ramos y los 10 jugadores con más Clásicos jugados" (in Spanish). Goal.com. 29 October 2018. Retrieved 29 October 2018. ^ "UEFA Europa League: History: New format provides fresh impetus". UEFA. Retrieved 20 June 2015. ^ "Classic Football: Clubs: FC Barcelona". FIFA. Retrieved 14 August 2014. "Classic Football: Clubs: AS Roma". FIFA. Retrieved 20 June 2015. Wikimedia Commons has media related to Real Madrid-FC Barcelona rivalry.